Art brut has come all the way from figurative and ornamental art, which dominated Jean Dubuffet’s collection, to conceptual Brut Now, the gestures of Art Brut 2.0 and the activities of BrutPop Collective. This transformation compels a revision of the art brut phenomenon. And although art brut, seemingly free from cultural influences, is now witnessing its triumph in a pop-cultural rendition, it has not lost its quality as a point of disappearance in art – the symbolic ▲B. The above enumerated new faces of art brut have been showcased in the recent exhibitions: “Brut Now. Art Brut in Technological Times” at Museums of Belfort /2017/ and “Art Brut Live. Contemporary Art Brut from Bruno Decharme’s Collection” /2015/ at DOX in Prague. Those were some of the most interesting exhibitions in the recent years which revealed the conceptual strategies employed by outsiders. “Art Brut Live” featured: Pepe Gaitan, John Devlin, Julius Bockelt, Beverly Beker, Kunizo Matsumoto, J.B. Murray, Martin Thompson, Harald Stoffers, George Wiedener, Anibal Brizuela. In turn, the exhibition ”Brut Now” focussed on quasi-scientific investigations based on minimalistic gestures performed with the use of new media. The presented artists included: Terry Davis, Oscar Morales, John Urho Kemp, Enzo Schott, Melvin Way, Yohann, Bintou, Dan Miller, Jean-Marie Massou, Rhalidou. The problematic of explorations pursued beyond the conventional borders of the art territory became the object of the exhibition “At the Edge of the Worlds” at Palais de Tokyo in Paris /2015/, which embraced all kinds of artistic practices, including those of outsiders, such as: Zdenek Kosek, Jean Perdrizet, Jesse Krimes, George Widener. Those exhibitions transgressed mental constraints and opened up the field of new experiences of the inscrutable in art. John Urho Kemp, known as “Crystal John” was one of the most fascinating representatives of conceptual art brut/outsider art. A chemist. His creative method reveals the scientific profile of his investigations. 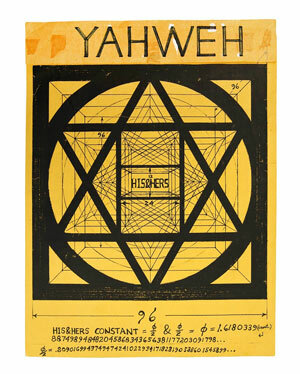 He borrowed from his own knowledge as if from the tree of the knowledge of good and evil, maintaining ties with the spiritual aspect of Kabbalah – the Sufi tradition of Enneagram. The work of John Urho Kemp adopted the form of “numerical mantra” and became a special kind of „alphanumerical song,” as it was aptly defined by Gael Charbau. A short biographical note left by the artist highlights his interest in philosophical and metaphysical investigations. John Urho Kemp was an alchemist who devoted himself completely to studying the mystery of regular dodecahedron. A messenger who explored the structure of the quartz crystal in an attempt to decipher the mysterious code of the Universe – the code he wanted to offer to the people. He used endless calculations, comparisons, complicated mathematical operations to show the way to holy cities. His diagrams contain the mysterious relation between the real world and a supposed transcendental reality. He thus built enigmatic “passages” that led to mystical revelation: The Key of Everlasting Love, The Gate of Love, The Key of Immortality, Seven Keys to Salvation, The Miracle Formula Of Life, The Dream Formula, The Miracle Eye, The Miracle Love Cube, Sixteen Crystal Gates to Opening the Third Eye, The Miracle Matrix. 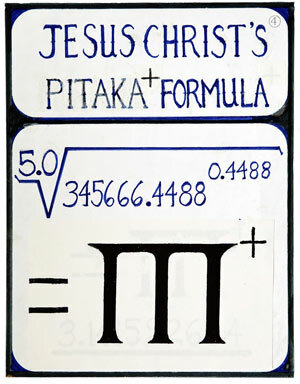 Kemp created diagrams made of numbers, formulas and signs which he multiplied. He photocopied his works and spread them as “gifts” amongst as many encountered people as possible. Those were most often sheets of paper of 4 x 5 inches in size, printed on both sides. The „gifts” were supposed to operate as a kind of virus, a magical formula, philosopher’s stone by means of which Kemp – a sensitive observer of the natural world and human nature, a vegan and a watcher of solar eclipses – initiated us into the magical formulas of the world. While distributing the “gifts,” Kemp met his friend, photographer Aram Muksian, who looks after the artist’s archive, which comprises thousands of pages of diagrams, charts, numerical sequences, mathematical poems, drawings, equations, collages from the years 1997–2010. Kemp’s archive is distributed, thus following “Crystal John’s” call: “FREE MIRACALS. PLEASE TAKE ONE SHEET OF EACH. THANK YOU!”. The collaboration between the Tak Gallery and Aram Muksian made it possible for the artist’s works to colonise the space of the exhibition ▲B.